Canyons of the Ancients National Monument is a national monument protecting an archaeologically-significant landscape located in the southwestern region of the U.S. state of Colorado. The monument's 176,056 acres (71,247 ha) are managed by the Bureau of Land Management, as directed in the Presidential proclamation which created the site on June 9, 2000. Canyons of the Ancients encompasses and surrounds three of the four separate sections of Hovenweep National Monument, which is administered by the National Park Service. 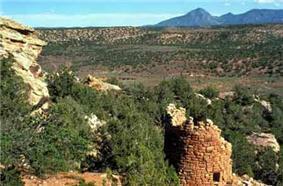 The monument was proclaimed in order to preserve the largest concentration of archaeological sites in the United States, primarily Ancestral Puebloan ruins. As of 2005, over 6,000 individual archeological sites had been identified within the monument. Canyons of the Ancients National Monument is located 9 miles west of Pleasant View, Colorado in southwestern Colorado. The monument's northern and eastern boundaries are canyons. Its western boundary is the Colorado-Utah state border. Lands south are bordered by the Ute Mountain Reservation and McElmo Creek. Ancient Pueblo people lived in the Canyons of the Ancients in the 900s; Lowry Pueblo, built during the Great Pueblo period, was built atop pit-house built in the 900s. For a fuller understanding of the architecture and life style during this period, pueblo buildings in the Mesa Verde region were built with stone, windows facing south, and in U, E and L shapes. The buildings were located more closely together and reflected deepening religious celebration. Towers were built near kivas and likely used for look-outs. Pottery became more versatile, including pitchers, ladles, bowls, jars and tableware for food and drink. White pottery with black designs emerged, the pigments coming from plants. Water management and conservation techniques, including the use of reservoirs and silt-retaining dams also emerged during this period. As refinements in construction techniques increased, the Puebloans built larger pueblos, or villages, on top of the pit-houses starting about AD 1090. Lowry Pueblo had just a few rooms and 2 kivas in 1090 and the village was expanded two times about 1103 and 1120 until it had 40 rooms, 8 kivas and one great kiva. Like their ancient neighbors at Hovenweep National Monument and Mesa Verde National Park, the Lowry Pueblo dwellers were farmers and hunters. They grew beans, corn and squash and raised turkeys. They also made and decorated pottery. At least 6,000 distinct structures have been identified in the monument, and the density of archeological remains is the highest of any region in the United States. The vast majority of stone structures in the national monument are from the Ancient Puebloans era. More than 20,000 sites have been identified, in some places more than 100 sites per square mile. After building basic pit style structures at first, the Puebloans later built villages with cliff dwellings. Archaeological ruins also include Sweat lodges, kivas, shrines and petroglyphs. Reservoirs with stone and earthen dams, including spillways and also numerous check dams, built in case of flash floods. Stone towers which may have been lookout or sentry posts, are found scattered throughout the monument. Lowry Pueblo The Lowry Pueblo National Historic Landmark consists of 8 kivas, a great (community) kiva and 40 rooms built as high as three stories. The underground great kiva was built about AD 1103 and had murals painted over about 5 layers of plaster. About 1110 another kiva was built on top of the original kiva. Based upon the size of the kiva it's thought that the Lowry Pueblo may have been a local center for religious gatherings and celebration. Painted Hand Pueblo The Painted Hand Pueblo is a backcountry site that consists of non-excavated ruins built upon boulders along a cliff-face and a standing tower. The pueblo received its name from a boulder with pictographs of hands. Sand Canyon Pueblo One of the largest pueblos of the 13th century, Sand Canyon Pueblo, built between 1250 and 1280, contains at least 20 multi-family room blocks with 420 rooms, 90 kivas, and 14 towers. A spring runs through the center of the walled site that held up to 725 people. Construction was exacting, with care taken to shape stone, and some double and triple walls for stability. Families lived in clusters of rooms that included living, storage and work rooms and had their own family kivas. The community shared roofed plazas, great kivas and towers often connected to kivas. By 1280 new construction had stopped and people began migrating out of the pueblo; By 1290 the pueblo was abandoned, as were other Colorado pueblo sites, never to be inhabited again by puebloan people. Unlike other Ancient Pueblo site abandonment, it appears that the people of the Canyons of the Ancients left the sites much earlier than their neighbors, some time in the mid-1100s. Some of the artifacts found from the site show a connection to the Chacoan culture, while others are similar to those of the Mesa Verde dwellers. After AD 1300 hunter-gathers, ancestors of the Ute and Navajo, moved into the southwestern Colorado and southeastern Utah and came to inhabit the region. The people from who the Ute descended arrived in the area from the west in this period from 1300 to the 1700s. The Ute's ancestors are hunter-gatherers who in the 1100s began migrating east from the present southern California area into a large hunter-gathering territory as far east as the Great Plains and in the canyons and mountains of eastern Utah and Colorado. During this period, the Spanish colonial reach extended to northern New Mexico, where they settled in the 1500s. They introduced items for trade, such as guns and horses, new and deadly diseases, and cultural influence in the forms of religion, language, and forms of government. In the 1700s Spanish missionaries visited the area looking for a route to Spanish missions in California. One of the expeditions was that of Spanish friars Silvestre Vélez de Escalante and Francisco Atanasio Domínguez who traveled from New Mexico, through western Colorado to Utah. The first Anglo American people arrived in the early 1800s, starting with trappers. With the discovery of precious ores in the last decades of the 19th Century, miners and other settlers moved into the region. By the mid-1800s the United States government and Native American tribes were at war over land ownership. People were forced to leave their homelands. The Navajo had moved south and the Ute territory was significantly reduced. 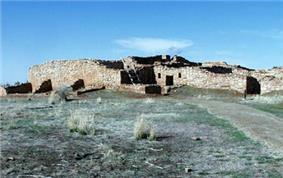 Lowry Pueblo was excavated in 1928 and went through a restoration process in 1965. Two years later it was named a National Historic Landmark and was listed on the National Register of Historic places. The U.S. Bureau of Land Management administers the monument and enforces regulations balancing resource protection with land conservation. It was created by executive proclamation in 2000 with the intention of protecting the archaeological, natural and geological resources. Facilities at the Lowry Pueblo include parking, a picnic area, toilet and trail. Sand Canyon Pueblo also has a trail, which leads to McElmo Canyon. Cahone Canyon is located about 4 miles southwest of the town of Cahone, Colorado is about 9,156 acres. The wilderness area, varying from 5,900 to 6,000 feet (1,800 to 1,800 m) in elevation, consists of three canyons with piñon-juniper woodlands and riparian and sagebrush ecosystems. Cross Canyon is located south of Cahone Canyon, about 14 miles southwest of the town of Cahone, Colorado is about 12,721 acres, 1,008 acres cross into Utah. The wilderness area, varying from 5,140 to 6,500 feet (1,570 to 1,980 m) in elevation, consists of three canyons (Cross, Ruin, and Cow), with piñon-juniper woodlands and riparian and sagebrush ecosystems. Squaw/Papoose Canyon is located about 12 miles south of Dove Creek and is about 11,357 acres, 6,676 acres cross into Utah. The wilderness area, varying from 5,300 to 6,600 feet (1,600 to 2,000 m) in elevation, consists of two canyons (Squaw and Papoose). The Anasazi Heritage Center is also the visitor center for the Canyons of the Ancients National Monument and includes artifacts from the monument, museum with interactive exhibits, library and theatre. Information is available there regarding the Ancient Puebloan culture, Trail of the Ancients Byway and the Canyons of the Ancients National Monument. Vandalism and treasure hunting are difficult to minimize due to an inadequate number of federal employees and law enforcement personnel to monitor and prosecute those who deface ruins or steal archeological remains. Thousands of undocumented artifacts have been removed from the monument and now reside in private collections. A news article in July 2006 reported that funding for the monument had decreased by almost 40% since 2004, and that a particularly severe looting episode occurred in January 2006. The northern part of the Monument in part has gently sloping, relatively even surfaces ranging in elevation from about 6,700 feet (2,000 m) in the east to about 6,000 to 5,500 feet (1,800 to 1,700 m) in the west. These surfaces are upheld by sedimentary rocks of Cretaceous age that are mostly covered by much younger gravel and sand layers deposited in the last several million years. The region is incised by canyons that drain south and west to McElmo Creek; the creek falls from the east at about 5,800 to 4,800 feet (1,800 to 1,500 m) west at the Utah border. The oldest rocks are exposed in McElmo Canyon and are sedimentary layers of Jurassic age. In and near the Monument, these sedimentary rocks have been bent upwards to form a dome, the McElmo Dome: most of the Jurassic rocks are below the surface in the regions immediately bordering the area. The southern boundary of much of the Monument lies just north of McElmo Creek. The Ute Mountains to the south are cored by igneous intrusions and rise to 9,979 feet (3,042 m). The following description of the geology of the Monument is derived mostly from contributions to Anderson et al. (1997), unless otherwise referenced. The nomenclature of the rock units here may not represent the present consensus. The sedimentary sequence is over 1,500 feet (460 m) thick and is represented by the stratigraphic units listed below. Cretaceous (145.5–66 million years ago) Dakota Sandstone Mostly sandstone, locally with conglomerate and thin beds of shale and coal. 100 feet (30 m) It was deposited during the Cretaceous Period (about 95 million years ago). Flaked tools have been made from chert clasts extracted from the conglomerate (Gerhardt et al.). Burro Canyon Formation Mostly sandstone, siltstone, and mudstone, formed from river deposits, and it is similar to the Dakota Sandstone but lacks coal beds. 100 feet (30 m), but highly variable. Silicified sandstone in this unit has been used to make flaked tools (Gerhardt et al.). Jurassic (199.6–145.5 million years ago) Morrison Formation Parts of this ash altered to zeolites and chalcedony have been used to make flaked tools. The is made mostly of siltstone and sandstone formed from river and lake deposits. Some layers are made from volcanic ash. (Gerhardt et al.). 600 feet (180 m) Elsewhere in the Morrison Formation, many fossils of large dinosaurs have been found, as have deposits of uranium and vanadium. Bluff Sandstone (also called Junction Creek Sandstone) In part it formed from a great deposit of windblown sand (an erg). 250 feet (76 m) Elsewhere well-preserved dinosaur tracks have been found in rocks of this unit. Entrada Sandstone Consists of about 30 feet of red siltstone that commonly weathers to a knobby surface, overlain by about 80 feet of sandstone. 110 feet (34 m) Cliff dwellings and other structures are common in alcoves in this sandstone. Navajo Sandstone Formed from wind-blown sand. 100 feet (30 m) The trail head at Sand Canyon near McElmo Creek is on rocks of this unit. Wingate Sandstone Formed from wind-blown sand. At least 170 feet (52 m) It was deposited about 190 million years ago. Carbon dioxide is produced from rocks of Mississippian age (Carboniferous Period 359.2–299 million years ago) in the McElmo Dome, from wells drilled to a depth of about 8,000 feet (2,400 m). The dome contains one of the largest deposits of carbon dioxide in the United States, and the extracted gas is used for enhanced oil recovery. This carbon dioxide reservoir has been studied to learn about possible underground storage (carbon sequestration) of carbon dioxide. In 1986 the area was designated as the Anasazi Area of Critical Environmental Concern by the Bureau of Land Management to ensure there are no new leases for oil and gas industry; Leases will only be given to promote the conservation of oil and gas resources. The decision showed a blatant disregard for the proclamation [that states that leases should only be made to protect and preserve oil and gas resources]. That does not bode well for the future management for the rest of this monument or any monument in the country. In 2006 the National Trust for Historic Preservation reported that the nation's push for energy resources on federal land is occurring at a cost of archaeological and cultural resources at Canyons of the Ancients National Monument and Utah's Nine Mile Canyon. The National Trust further asserted that the Bureau of Land Management has only documented 17 million acres of the 262 under its stewardship. With an emphasis on conservation, protection and restoration, the National Landscape Conservation System and Canyons of the Ancients National Monument represent a new era of management for the BLM. After 130 years of exploration and research identifying tens of thousands of irreplaceable and fragile archaeological sites, we know that Canyons of the Ancients represents the best of our cultural heritage. Using an army of volunteers who contribute on the ground services and applying the principles of balanced management and science-based decision-making, this crown jewel preserves ancestral homes and landscapes for Native American citizens and for children and communities throughout the United States. The Monument is home to a wide variety of desert wildlife, some of which are the American kestrels, Gambel’s quail, Golden eagles, Long-Nosed Leopard lizard, Mesa Verde nightsnake, mourning dove, Peregrine falcons, Red-tailed hawks the Twin-spotted Spiny Lizard. Mammals that pass through the riparian and piñon-juniper woodland are jackrabbits, Mule deer, ringtail, fox, muskrat, beaver and bobcat. Wildlife and plant habitat are threatened by increased road and building construction by oil and gas interests. 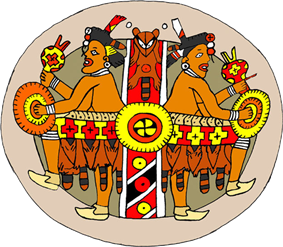 ^ There are several references that Lowry Pueblo is 9 miles west of Mesa Verde National Park, which is partially true: it's 9 miles west of Mesa Verde's western edge, but it's Mesa Verde is at least as far further south. The more correct statement from Gregory is that Lowry Pueblo is 9 miles west of Pleasant View, Colorado. ^ a b "National Monument detail table as of April 2012". Bureau of Land Management. Retrieved 2012-12-27. ^ Woodall, Kristina L. History and Intent of the Proclamation for Canyons of the Ancients National Monument. Bureau of Land Management. pp. 1, 34. Retrieved 9-24-2011. ^ a b c d e f Gregory, Lee. Colorado Scenic Guide: Southern Region. Johnson Books, Boulder, Colorado, 1996 (1st edition 1984). pp. 17-18. ISBN 1-55566-145-9. ^ Woodall, Kristina L. History and Intent of the Proclamation for Canyons of the Ancients National Monument. Bureau of Land Management. pp. 33-34. Retrieved 9-24-2011. ^ Gregory, Lee. Colorado Scenic Guide: Southern Region. Johnson Books, Boulder, Colorado, 1996 (1st edition 1984). p. 80. ^ Wenger, Gilbert R. (1991) . The Story of Mesa Verde National Park. 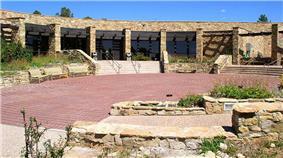 Mesa Verde Museum Park, Colorado: Mesa Verde Museum Association. ISBN 0-937062-15-4. pp. 39-45. ^ a b Wilson, D. Ray (1990) Colorado Historical Tour Guide. Carpentersville, IL: Crossroads Communications. p. 374. ISBN 0-916445-26-7. ^ a b Woodall, Kristina L. History and Intent of the Proclamation for Canyons of the Ancients National Monument. Bureau of Land Management. p. 34. Retrieved 9-24-2011. ^ a b Canyons of the Ancients: Background. Bureau of Land Management. Retrieved 9-24-2011. ^ a b c d e f Canyons of the Ancients Visitor Information. Bureau of Land Management. Retrieved 9-24-2011. ^ Casey, Robert. L. (1993) . High Journey to the Southwest. The Globe Pequot Press. p. 229. ISBN 1-56440-151-0. ^ Plog, Stephen. (1997). Ancient Peoples of the American Southwest. London: Thames and Hudson. ISBN 0-500-02116-3. 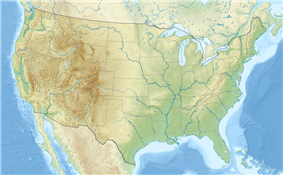 ^ a b c d e The Post-Pueblo Period: A.D. 1300 to Late 1700s. Crow Canyon Archaeological Center. 2011. Retrieved 9-26-2011. ^ Pueblo People Today. Crow Canyon Archaeological Center. 2011. Retrieved 9-26-2011. ^ published in the University of Utah Press in 1995.The Dominguez and Escalante Journal UintahBasintah.org, which cites Chavez Waner's Dominquez and Escalante Expedition, 1776. ^ The Historic Period: Late A.D. 1700s to Mid-1900s. Crow Canyon Archaeological Center. 2011. Retrieved 9-26-2011. ^ Skopec, Eric. (2007). The Anasazi Guide. Self-published at www.lulu.com. p. 143. ISBN 978-1-4303-2648-9. ^ Woodall, Kristina L. History and Intent of the Proclamation for Canyons of the Ancients National Monument. Bureau of Land Management. p. 1. Retrieved 9-24-2011. ^ Woodall, Kristina L. History and Intent of the Proclamation for Canyons of the Ancients National Monument. Bureau of Land Management. p. 37. Retrieved 9-24-2011. ^ "Mesa Verde County Archaeology Brochure". Mesa Verde Country Visitor Information Bureau. p. 3. Retrieved 2011-06-18. ^ Stevens, S. H., Pearce, J. M., and Rigg, A. A. J. (2001) Natural analogs for geologic storage of CO2: An integrated global research program. First National Conference on Carbon Sequestration, U. S. Department of Energy. ^ a b Binkly, Gail. Thumpers hit a speedbump. High Country News. 9-30-2002. Retrieved 9-24-2011. ^ Associated Press. Preservationists: Energy push eroding West. May 16, 2006. MSNBC.com. Retrieved 9-24-2011. ^ Woodall, Kristina L. History and Intent of the Proclamation for Canyons of the Ancients National Monument. Bureau of Land Management. p. 49. Retrieved 9-24-2011. ^ Kruger, Fraces Alley; Meaney, Carron A. (1995). Explore Colorado: A Naturalist's Notebok. Photography by John Fielder. Englewood, Colorado: Westcliff Publishers and Denver Museum of Natural History. pp. 42-61. ISBN 1-56579-124-X. Anderson, O. J., Kues, B. S., and Lucas, S. G. (editors) (1997) Mesozoic Geology and Paleontology of the Four Corners Region. New Mexico Geological Society Forty-Eighth Annual Field Conference. Gerhardt, K. M., Lacey, P. F., McBride, R., and McBride, D. Raw lithic material sources near the Greenlee Site. Retrieved May, 2009. Gibbon, Guy E.; Ames, Kenneth M. (1998) .Archaeology of Prehistoric Native America: An Encyclopedia ISBN 0-8153-0725-X.